It looked a match-winning total after Morkel ripped out the first three batsmen to leave Zimbabwe reeling on 30 for four. Morkel took three for 20. 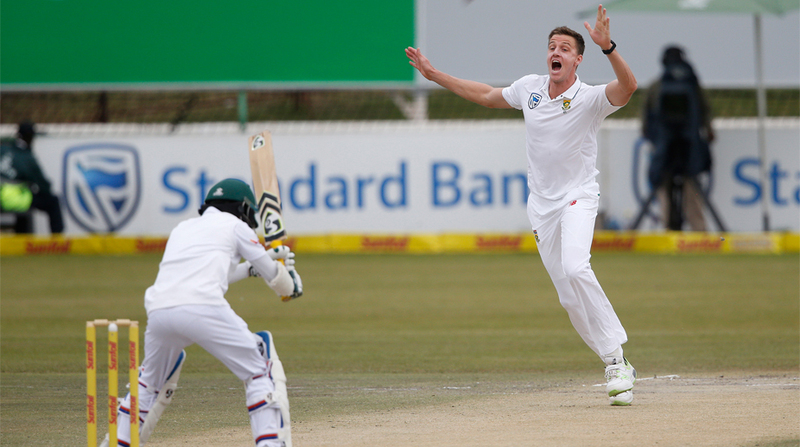 Morne Morkel reopened the debate about conditions under floodlights with a devastating spell of fast bowling as South Africa took command on the first day of a four-day, day-night Test against Zimbabwe at St George’s Park on Tuesday. Aiden Markram hit 125, his second century in three Test matches, as South Africa made 309 for nine declared. Both Markram and Zimbabwe captain Graeme Cremer said there was a marked difference in conditions for batsmen against the pink ball under lights. “From twilight onwards it does tend to move around quite a bit, definitely more than this morning,” said Markram, who was dismissed with what proved to be the last ball before the dinner break. With South Africa losing five wickets for 58 runs after dinner, a total of nine wickets fell for 88 runs in a two-and-a-half hour floodlit session. Cremer said he was not too disappointed with his team’s performance. With South Africa declaring with more than an hour remaining on the first day, Markram said it could become a trend. Cremer said Zimbabwe’s immediate objective was to avoid having the follow-on, which in a four-day Test is 150 runs. “We will try to make the most of daytime batting so we can bowl at them under lights,” he said. Morkel trapped Hamilton Masakadza leg before wicket with the first ball of Zimbabwe’s innings, dismissed Chamu Chibhabha for six with the help of a blinding catch by Temba Bavuma at fourth slip and had Brendan Taylor caught behind for the second duck of the innings. New cap Ryan Burl showed resolve in batting through to the close on 15 not out. Opening batsman Markram, 23, continued a dream start to his Test career. Markram made a watchful start on Tuesday against some testing bowling from Zimbabwe new ball pair Kyle Jarvis and new cap Blessing Muzarabani. He took 104 balls to reach fifty but accelerated to post his century off 175 balls with 13 fours and a six. He added another four and a six before falling to the 204th ball of his innings. There will be tougher challenges for Markram than Bangladesh and Zimbabwe but Tuesday’s innings took his total to 380 runs in his first four Test innings at an average of 95.00.